Glacier Creek Preserve is a 172 ha (424 acre) preserve situated northwest of Omaha in the rolling hills of eastern Nebraska. Embedded within the Preserve is the 57 ha (140 acres) Allwine Prairie Tract, a restored tallgrass prairie created in 1970. Large enough to sustain a diversity of functioning plant and animal communities, Glacier Creek Preserve incorporates an entire sub-watershed. This feature protects the preserve against effects of surrounding land use thus reinforcing its sustainability into the foreseeable future as a unique metropolitan area preserve available for education, research, and appreciation of our natural heritage. The objective of Glacier Creek Preserve is to maintain an ecologically sustainable, landscape-level wildlife preserve focusing on tallgrass prairie and related ecosystems that will serve present and future generations both as a site for environmental education and as an important community resource for the appreciation of our historic prairie environment. Glacier Creek Preserve is in Douglas County at 14810 State Street, Bennington, Nebraska 68007. The entrance to the preserve is located on the north side of State Street about 1 km (one-half mile) west of the intersection of 144th and State Streets or 1 km (one-half mile) east of the intersection of Military and State Streets. Brown and white road signs guide you to the entrance. Follow the gravel road down the hill to the headquarters parking area. GPS coordinates of the Barn at Glacier Creek, the Preserve’s education and research facility, are: Latitude: N 41.33886 Longitude: W -96.14702. 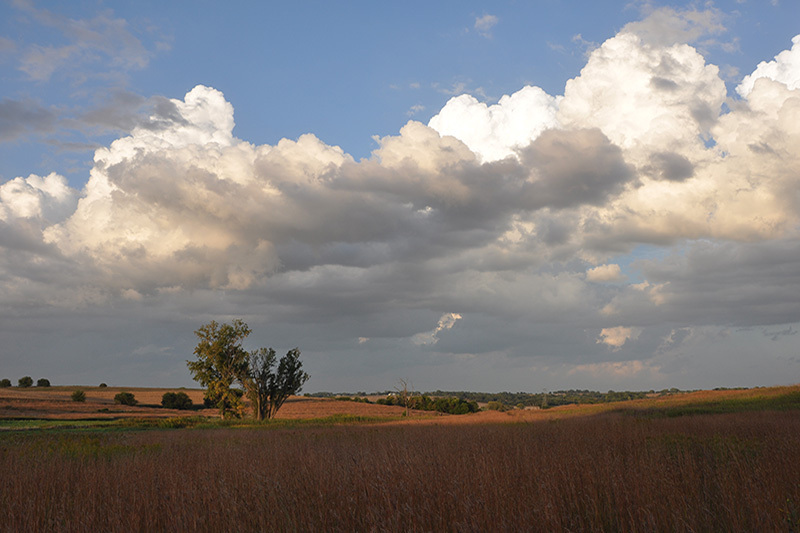 Glacier Creek Preserve is a 172 ha (424 acre) restored tallgrass prairie preserve that is divided into four tracts: The Allwine Prairie Tract (the original preserve created from cropland in 1970), the Papio Tract, the Barbi Hayes Overlook, and the Bouteloua Tract. The Barn at Glacier Creek: Essential to preserve activities is The Barn at Glacier Creek (aka the Barn), the preserve's environmental education and research facility that provides classroom space, a field lab, restrooms, and a multi-functional space in the hayloft of the second floor that can accommodate over 50 individuals. The Barn also houses the preserve office, staffed by the Outreach and Administrative Specialist, the Land Management Specialist, and the Hubbard STEM Learning Instructor, who coordinates UNO STEM activities at the preserve. The Barn, a 1900's era historic barn, was donated and moved from its original location on the Roy Johnson family farm to Glacier Creek Preserve in 2012 with the donation provided by the Roy Johnson Family Partnership and Barbi Hayes, a major owner of the partnership. Barbi Hayes also funded upgrading the Barn which includes geothermal heating and cooling, is fully ADA accessible, and has full wireless and port access to the internet. Use of the Barn is coordinated by the Preserves Director. Other structures in the headquarters area includes the Land Management Specialist’s house, a 1950's era double-garage storage structure, and a metal shed for Preserve vehicles. Flora: More than 350 species of woody and herbaceous plants, 17 species of bryophytes, and 10 species of lichen have been identified at various locations throughout Glacier Creek Preserve, with most of the typical prairie species found in the original 1970's restoration. Quantitative surveys find slopes and hilltops of the Tallgrass areas dominated by big bluestem (Andropogon gerardii) with little bluestem (Schizachyrium scoparium) and sideoats grama (Bouteloua curtipendula) being common. Lowland areas are predominantly big bluestem, reed canary grass (Phalaris arundinacea), and switchgrass (Panicum virgatum). Little bluestem and sideoats grama dominate the Mixed-Grass Prairie. 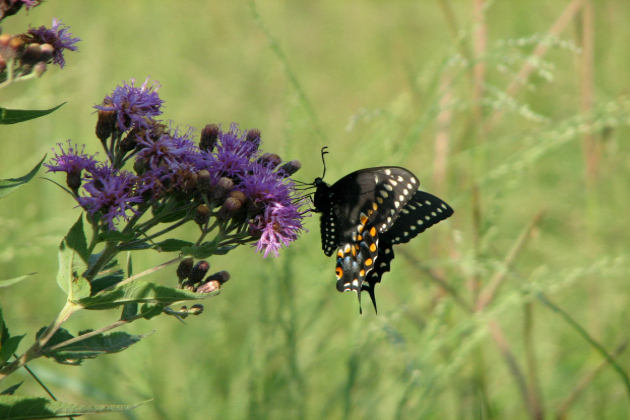 The common forbs include leadplant (Amorpha canescens), Canada and prairie goldenrod (Solidago canadensis and S. missouriensis), common milkweed (Asclepias syriaca), round-head bush-clover (Lespedeza capitata), grayhead prairie coneflower (Ratibida pinnata), and rosinweed (Silphium integrifolium). Click here for the Glacier Creek Preserve plant species list. 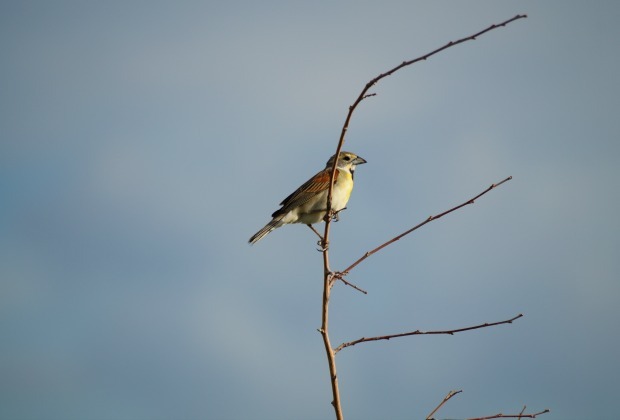 Fauna: In addition to a diverse flora, over 170 species of birds, amphibians, reptiles, and mammals have been observed in various locations throughout the Preserve. The most common breeding bird species include both residents, such as the red-tailed hawk (Buteo jamaicensis), great horned owl (Bubo virginianus), sedge wren (Cistothorus platensis), and mourning dove (Zenaida macroura), and migrants, such as the western meadowlark (Sturnella neglecta), red-winged blackbird (Agelaius phoeniceus), dickcissel (Spiza americana), and grasshopper sparrow (Ammodramus savannarum). The LeConte’s (Ammodramus leconteii) and Harris’ sparrows (Zonotrichia querula) and northern harrier (Circus cyaneus) are among less common migrants found at the preserve. Among mammals of the prairie and woodland, the most common include the prairie and meadow voles (Microtus ochrogaster and M. pennsylvanicus), thirteen-lined ground squirrel (Spermophilus tridecemlineatus), North American deermouse (Peromyscus maniculatus), coyote (Canis latrans), red fox (Vulpes vulpes) and white-tailed deer (Odocoileus virginianus). The Plains Gartersnake (Thamnophis radix), Northern Prairie Skink (Plestiodon septentrionalis), and Woodhouse's Toad (Anaxyrus woodhousii) are among the most common herpetofauna in drier locations with frogs, such as Blanchard’s Cricket Frog (Acris blanchardi), the Plains Leopard Frog (Lithobates blairi), and the Boreal Chorus Frog (Pseudacris maculata) found principally along Glacier Creek. A diverse invertebrate community of the restored prairie includes 56 butterfly species, which includes a large population of the regal fritillary (Speyeria idalis), a butterfly species of concern for the U.S. Fish and Wildlife Service. In addition to these mostly terrestrial invertebrates, other invertebrates are found in Glacier Creek itself, including dragonflies (Aeshna spp. ), damselflies (Family: Coenagrionidae), and caddisflies (Family: Limnephilidae). In general, the overall diversity of fauna at Glacier Creek Preserve approximates that of local native prairie remnants indicative of a well-established diversity of habitats. Check out the following Glacier Creek Preserve species lists: Amphibians & Reptiles, Birds, Butterflies, and Mammals. Climate: The climate of the region is typical of continental interiors with temperatures between 1981 and 2010 averaging 10.6 C (51 F), ranging from a low of 0.8 C (33 F) in January to a high of 30.7 C (87 F) in July. Precipitation during the same time averaged 778 mm (30.6 in), ranging from a low of 19 mm (0.71 in) in January to a high of 121 mm (4.76 in) in May. Eighty percent of annual precipitation fell during the growing season (April through October) (U.S. Climate Data). Soils: Soils of the Preserve are typical of midwestern prairie soils with most of the Mollisol soil order (Hapludolls, with some Argiudolls) and the remainder Inceptisols (Eutrudepts and Udorthents). The six soil complexes covering the majority of the Preserve landscape are Contrary-Marshall silty clay loams on 6-11% slopes (115 acres), Contrary-Monona-Ida complex on 6-17% slopes (91 acres), Judson silty clay loam on 2-6% slopes (72%), Kennebec silt loam in the floodplain along the Big Papillion Creek (51 acres), Smithland-Kenridge silty clay loams along the Glacier Creek lowland (25%), and Burchard-Contrary-Steinauer complex on 7-16% slopes (7%). Loess covers the surface of the majority of the Preserve although the Burchard-Contrary-Steinauer complex is one location where remnants of glacial deposits (glacial till) in the form of gravelly material, from pebbles up to baseball sized rocks, may be seen on the surface. This glacial till, which is associated with springs that maintain Glacier Creek, is the source of the creek’s name. Both the Preserve and the recently acquired property are dominated by south and north-facing slopes. Natural Features: While the dominant natural features of the Preserve are tallgrass and mixed-grass prairies, several other natural features also are represented on the Preserve, most reflecting the surface and sub-surface hydrology of the area. Two small creeks, Glacier Creek to the south and North Creek to the north, add flowing-water (lotic) environments to the diversity of habitats on the preserve. Springs, for example, provide a continuous source of water for Glacier Creek such that, even during dry years (e.g. 2012) the creek maintains a constant (base) flow averaging approximately 265 liters (70 gallons) per minute. While not quantified, North Creek also has been observed to maintain a constant flow. In addition to creeks, sub-surface water temporarily surfaces along some slopes only to go below ground a few meters down-slope creating unique slope wetlands. These are small areas on slopes where wetland plant communities of willows (Salix spp. ), cattails (Typa spp), horsetail (Equisetum spp. ), sedges (Carex spp.) and rushes (Scirpus spp.) may be found, an unexpected location for these species in that they typically occur in lowlands and along creek margins. Even in the lowlands, sub-surface water creates micro-habitats only a few meters across creating yet another unique plant community, these dominated mostly by sedges. Wetlands are yet another natural feature of the Preserve. A historic wetland occurs at the junction of three channels in the Bouteloua Tract. Dominated by an understory of cattails and (unfortunately) reed canary grass (Phalaris arundinacea) that surround a small stand of willow, this wetland is visible in photos from the 1940's. While there is no evidence of tiling in this wetland, there have been some years when it has been cultivated along with the surrounding cropland. Several smaller wetlands may be found along the Glacier Creek lowland, particularly in the lower reaches of Glacier Creek that was converted from farm ponds to lowland prairie from 2000 to 2001. Anthropogenic Features: Beyond the existing and recent structures around the headquarters area, the preserve includes evidence of historic human use. The small Kobs Pioneer Cemetery (Nebraska State Historical Society), with remaining grave stones dating to 1879, is located on an east-facing slope of the Papio Tract and represents an important period of time in the settlement of eastern Nebraska. In addition, evidence of previous farm steads that once occurred north and west of the Allwine Prairie Tract occasionally reappear in the form of old bricks in the now-farmed fields. Even further in the past, evidence of Native American presence ca. 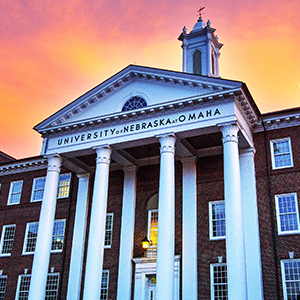 A.D. 1000-1400 was found during a recent archeological search by UNO faculty and students. Developing a more complete history of the site is part of ongoing efforts at the Preserve. Establishment (1959-1970): The Preserve was established in 1959 when Arthur and Antoinette Allwine donated the 65 ha (160 acre) Glen Haven Farm to the Biology Department at UNO (then Omaha University) for use as a wildlife preserve. The farm remained in cultivation until 1970 when Allwine Prairie Preserve was created with the seeding of 52 ha (130 acres) to tallgrass prairie and 5 ha (11 acres) to mixed-grass prairie. Development (1970-2008): Since 1970 (and continuing today) seeds of locally collected prairie grasses and forbs (i.e. herbaceous flowering plants other than a grasses) have been scattered throughout the restored prairie. These efforts, in conjunction with sod transplanted from threatened local prairie remnants, resulted in today’s diverse plant communities and the animals they support. In 2000, with the financial support of the Nebraska Environmental Trust, three farm ponds and surrounding volunteer trees were removed and 2 ha (5 acres) along Glacier Creek were graded and restored to lowland prairie with the goal of approximating the historic prairie creek channel referred to in the 1856 section line survey. Expansion (2009-Present): In 2009, 50 years after the original donation of Glen Haven Farm, the Preserve was expanded with the purchase of 34 ha (83 acres) to the east and northeast of Allwine Prairie Preserve. This addition was named the Papio Tract. With the expansion of the original preserve, the combined tracts, consisting of the Allwine Prairie Tract and the Papio Tract, was named Glacier Creek Preserve after the springs associated with glacial-based soil (i.e. glacial till) that maintains the small Glacier Creek that bisects the Preserve. Financial support for the purchase of the Papio Tract was provided by the Nebraska Environmental Trust (NET), the Papio-Missouri River Natural Resources District (NRD), and UNO. This purchase, which connects Glacier Creek to the Big Papillion Creek to the east, is scheduled to be restored to wetland and stream habitats by the NRD to serve as a stream and wetland mitigation bank. In 2013, the preserve was expanded again with the purchase of an additional 31 ha (76 acres) abutting the preserve on the north. This tract, originally called the North Viewshed, was subsequently named the Barbi Hayes Overlook. Importantly, this addition eliminated concerns about runoff coming on to the Preserve (and flowing into Glacier Creek) from the housing development scheduled for the site at the time. Aesthetically, acquiring the Barbi Hayes Overlook also ensured a future prairie view essentially from hilltop to hilltop (e.g. horizon to horizon). The purchase of the Barbi Hayes Overlook, was made possible by donations from Barbi Hayes, the NET, the NRD, and UNO. Support by UNO’s Dean of Arts and Science, Dr. David Boocker, was recognized by giving the name “Boocker Point” to the high point of the Barbi Hayes Overlook. The North Tract, 41 ha (101 acres) that abuts the existing preserve on the west and northwest, is the present focus of land acquisition and the last property available to buffer the preserve against surrounding development. In addition to its critical importance as a buffer, this addition would incorporate in the preserve the entire hill mass and its subsurface waters that maintain many of the preserve water-based natural features – development of this property for housing undoubtedly would adversely affect the hydrology, and ultimately the diversity of habitats, at Glacier Creek Preserve. In addition to these benefits, the North Tract would add to the preserve 6 ha (20 acres) of slope seeps that are too wet and rocky to be cultivated. These surface characteristics are likely to support their own micro-ecosystem, which would increase preserve-wide diversity of habitats available for education and research. An additional benefit of acquiring the North Tract would be the potential for providing direct access to an historic wetland at the headwaters of North Creek. 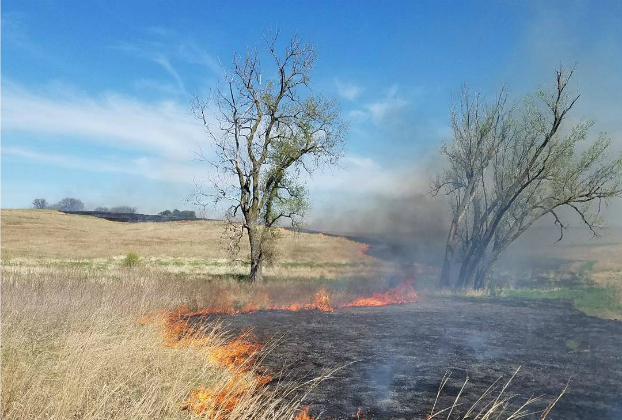 Prescribed Burning: Glacier Creek Preserve conducts prescribed burns to replicate the historic role of fire in maintaining a vigorous tallgrass prairie. The first prescribed burn was conducted in the spring of 1974 with the restoration burned in its entirety. Starting in 1975, the 140 acre original restoration was divided into three management units with only one unit burned each spring. This rotation maintained the 3-year fire return interval which is estimated to approximate historic fire frequency. Over the years, this fire frequency has been shown to maintain a diversity of habitats across the preserve for species favoring various stages of post-burn plant recovery. In 2016, two of the three burn units were further subdivided to facilitate smaller burned areas, although the 3-year fire return interval standard remains across the preserve. Visit our Prescribed Burning page to learn more about prescribed burning and how you can get involved. Mowing and Other Management: The entire restoration was mulch-mowed at various times from 1970 through 1977 in order to reduce ruderal (aka “weedy”) plants and facilitate establishment of seeded prairie species. Between 1978 and 2009, portions of the preserve were hayed in some years, mostly in the lowland, but never with any regularity. Today, mulch-mowing only occurs as part of the treatment of long-term research plots. 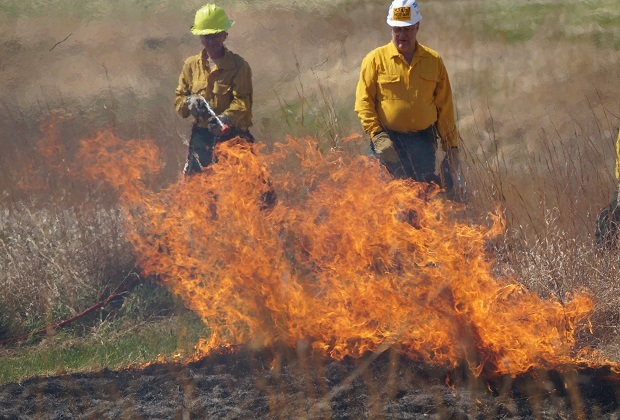 In addition to prescribed burning and mowing, present land management practices include mechanical and chemical control of noxious and invasive species and woody plants. Management activities include efforts to increase plant diversity by collecting seeds from local native prairie remnants and scattering them at pre-determined locations across the preserve. Records are retained on where and when seeds were collected and scattered. To learn how to get involved with these land management projects, visit the Volunteer page. Most of the recently acquired land is leased and used for rotation between corn and soybean crops while we move toward it’s restoration to prairie and prairie-associated habitats. These areas are leased for cultivation on a year-by-year basis, although small areas have been set aside for specific research projects. Keeping the land in cultivation eliminates the need to control large areas of ruderal species while also supplementing our operating budget as we gear up with equipment and supplies to manage more than two times the amount of land than was in the original preserve. The Papio Tract is scheduled to be a stream and wetland mitigation bank that will be developed by the Papio-Missouri River Natural Resources District. In this restoration, in addition to reconstructing the Glacier Creek stream channel, swales will be created in the lowland where standing water during the spring will provide habitat for amphibian reproduction. A similar effort will be conducted along the North Creek lowland. Uplands on both the Barbi Hayes Overlook and the Bouteloua Tract are to be restored to tall or mixed-grass prairie with strategically places areas of oak savanna. In the Bouteloua Tract, the historic wetland will be managed to reduce further head cutting to continue to function as active headwaters of Glacier Creek. Non-Research Use (classes, organizational visits, etc. ): The Barn at Glacier Creek, our environmental education and research facility, and the restored and unrestored land area surrounding the Barn (the Preserve), are available for use to the extent that such use does not affect the long-term objectives of the preserve. Representative of this use, in 2017, over 3700 scheduled visitors were recorded, most by classes ranging from pre-Kindergarten to graduate level. Many other visitors, however, took advantage of the preserves dawn-to-dusk availability and came simple to enjoy the prairie environment. Formal use of the Barn by groups (e.g. classes, organizations, etc.) is coordinated through the Preserves Director, who will provide a brief request form for your submission as well as information on use and cleanup of The Barn. Priority of use, however, goes to research and classes. A full list of conditions for use of the land area, which includes no pets, no commercial photography, and no weapons, may be found on the Visitor Use Policies. These conditions for use have been developed from past experience and are designed to ensure the safety of visitors, the quality of the preserve experience, and the health of our wildlife. Requests for staff time to assist in preserve use are requested from the Preserves Director, although on-site primary and secondary education activities ultimately work directly with the preserve's Outreach and Administrative Specialist. Visit the Pre-K-12 / Higher Education and General Public Access pages for more information. Research Use: Research is central to the department’s vision for Glacier Creek Preserve. Present and past research provides information that furthers our understanding of basic and applied ecosystem processes with a present focus on ecological, geological, and hydrological processes of prairies and prairie restorations. In particular, the preserve affords a site amenable to long term studies. Established in 1970, the Allwine Prairie Tract of Glacier Creek Preserve represents decades of post-restoration development. In addition, replicated long-term research plots established in 1978, are among the oldest known, continuously managed burn and mow plots in the region. The plots, replicated at a second site south of Mead, Nebraska, include annual and quadrennial spring, summer, and fall burning or mulch-mowing plots with vegetative data collected in the plots across the years. Glacier Creek Preserve is supported by an operating budget from the Department of Biology and the College of Arts and Sciences. Except for funded grants that allow Facilities and Administrative (F&A) costs, fees are not charged for use of the preserve for research. If you are including use of the Preserve in a grant proposal, we encourage you to consider including use-fees as they are important to supporting maintenance of all facilities, infrastructure, and services provided by the Preserve. The current fee structure may be requested from the Preserves Director. See Publications and Theses for a list of past research conducted at Glacier Creek Preserve. Support Glacier Creek Preserve through Omaha Gives! Glacier Creek and T.L. Davis Preserves offer many opportunities for students and non-students to get involved in various volunteer activities. Whether interested in gaining experience in restoring and managing natural communities or simply wanting to get outside and enjoy nature, we have the place for you. Learn more.